I live in New Delhi - India. Recently I paid a short visit to Kerela, the southern part of this country. This state is well known for its massive production of coconuts. Due to coconut's abundance in this region, you can buy it at just the 1/4th price which you normally pay in New Delhi. Fresh coconut has a completely different taste combined with a pungent smell that is missing in imported coconuts available in Delhi. Today I'm going to make a yummy coconut ice cream recipe that's not only irresistible but is also filled with goodness of almonds. I've also added chocolate chips to make it chunkier. To get the best results, you must use fresh coconuts and in case they're not available you can use some other ingredients like beetroot or fresh carrots. 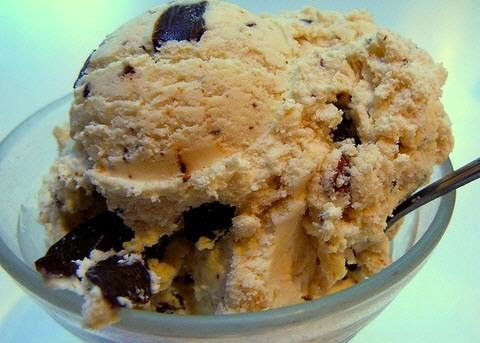 Enjoy this creamy and delicious coconut ice cream which includes crunchy almonds and a generous amount of chocolate chips to give you the required crunch. Grate coconut and blend it into a fine paste. Finely chop all the almonds and keep aside. Break chocolate chips into 1/2" pieces and keep aside. Do not include almonds and chocolate chips in this mixture. Stir & whip till everything is mixed well and it forms a smooth paste. Pour in ice cream containers and refrigerate. After 2 hours, take out the containers and add almonds. Add chocolate chips too and mix slowly. Again put back all the containers for refrigeration.